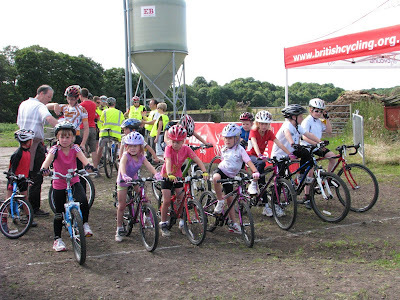 The sun shone for the Tyneside Vagabonds Go-Ride Games Cyclocross race at Thornyford Farm, Kirkley (near Ponteland), and a warm welcome was made to the riders who came to race. Over 30 riders attended and great fun was had by all. Racing got underway at 2.30pm. First off saw the U12,U10 and U8 boys and girls race. There was some tight racing in both the boys and girls races with Isobel Skinner taking the U8 Girls race and Joe Case taking the U8 boys. The U10 Girls race was won by Annie Johnson with Jamie Styles from Ponteland taking the U10 boys race. The U12 race was won convincenly by Joshua WIlliamson who went on to race the U14 event also. In the U14 race it was a close fought battle between Josh Craven and Andrew Potter but due to a chain slipping off for Craven it was a strong riding Andrew Potter who took win in the U14 race. Josh Craven and Andrew Potter are ones to watch for the future and I am sure we will see them battling again at future races. Robert Laidlaw took the U16 race. To round off a great day of racing it was over to the Adults race where Jo Reed rode a great race in her first Cyclocross race. Jo won the Ladies category. Alex McLean took the win in the mens but it was not an easy one as Adam Hogarth led the race from the start and looked very stong. When McLean passed Hogarth they raced hard for latter half of the race but McLean proved stronger to take the win.